Yuck, fishy burps… We don´t want them! Let’s look at the list of best burpless fish oil capsules that won’t leave an unpleasant aftertaste. And seal it with real-life tips to stop fishy burps once and forever. Most probably you’ve heard of it: fish oil belongs to one of the most frequently consumed dietary supplements. It’s rich in omega-3 fatty acids, which are very important for human health. Fish oil helps to support healthy blood pressure, arterial health, circulation, and more . Research shows [2-4] that other omega-3 benefits include fighting inflammation, improving bone and joint health, and even fighting depression and anxiety. These side effects may go away after your body adjusts to fish oil consumption and starts producing the enzyme necessary to properly digest fish. However, be sure to check with your health care professional if any of the mentioned side effects continue or are bothersome or if you have any questions about them. 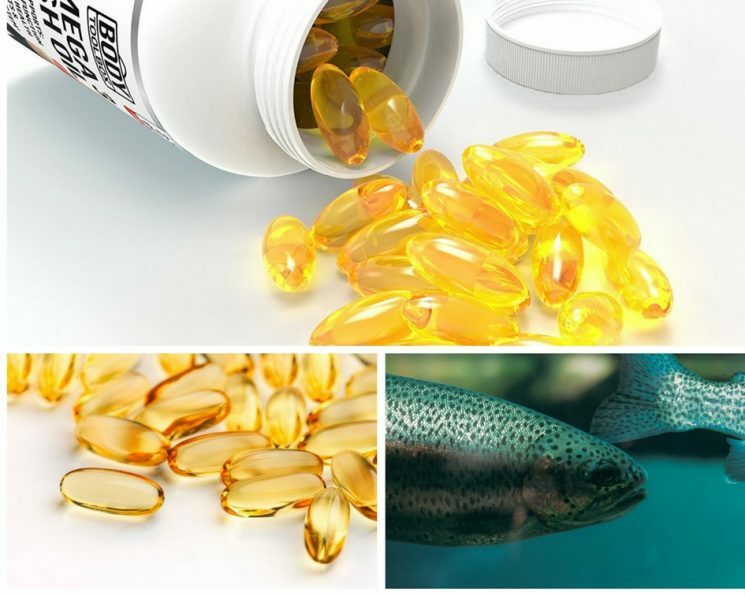 How to prevent “fish burps” and choose Best Burp-less Fish Oil Capsules? Buy enteric-coated fish oil. Enteric coatings are used on fish oil supplements to delay the point at which the fish oil is digested. Enteric coating prevents the pill from dissolving in the stomach so that it can be absorbed in the gut. Once the fish oil is in the intestine, you can’t belch it back up. Many fish oil capsules of this type are marked as “burpless fish oil capsules”. The top layer of capsules helps to prevent a fishy odor and aftertaste. Take pharmaceutical grade fish oil. Pharmaceutical Grade Fish Oil potentially contain 80 to 90% total Omega-3 fatty acid (as opposed to around 30% Omega 3 in many cheaper fish oils). Therefore, such fish oil pill has as much Omega-3 as three regular fish oil pills. But be aware, that “Pharmaceutical Grade Fish Oil” is neither an official FDA term, nor a medical term, and there are no officially agreed quality standards for Pharmaceutical Grade Fish Oil. In this case, how do you know if your fish oil is pharmaceutical grade? Look at the Omega-3 content. It should be above 75 or 80%. Substitute fish oil capsules with liquid fish oil. Counter to what you might expect, liquid fish oils won’t repeat on you the way capsules do. Actually, liquid fish oil will absorb faster into your system than capsules, because in order to absorb nutrients, your body must first break down the capsule. In fact, it only takes about one to four minutes for your body to fully assimilate liquid extracts compared to 30 minutes for capsules. If you are still unsure about the fishy smell, brush your teeth after you take it to avoid any residual of fish oil. Nowadays most liquid fish oils are produced with added flavors such as lemon or mint, and don’t have a fishy taste. If you have troubles swallowing even the smallest pills, or often bothered with fishy burps or belching, you might consider taking liquid fish oil. Freeze fish oil capsules. You can replicate enteric-coated fish oil effect by leaving the fish oil supplement in the freezer overnight and take it out right before consuming. This trick helps to slow down fish oil release in the stomach, so you will get burp-less fish oil. Take fish oil capsules with meals, and preferably with a large meal. This helps with reducing side effects like burping and belching. If this doesn’t work, take before bedtime as you won’t burp in your sleep. Consider having plant-based Omega-3 supplements. If none of the listed above precautions helps, you can try Omega-3 produced from marine algae. Check out here, how to choose the best vegan Omega-3 supplements. With this Burp-less Fish Oil, you will get 2,200mg of Fish Oil/serving, 1400mg of eicosapentaenoic acid (EPA) and 480 mg of docosahexaenoic acid (DHA). One regular serving should consist of 2 pills per day. Why is the concentration so high? Unlike molecularly distilled fish oil, Viva Naturals uses supercritical extraction method to concentrate the omega-3s in fish oil. This triples the amount per serving. Clean and purified fish oil, produced from wild caught fish from the highly-regulated coastal waters of Peru. Great for cardiovascular support, cognitive health, and metabolism boost. CONSUMER REVIEWS: 1) No fishy burps or aftertaste. 2) Helped with thinning of the body’s blood. 3) Helped with increasing of DHL (good cholesterol) level. 4) Works as the natural anti-depressant. The daily norm of eicosapentaenoic acid (EPA) and docosahexaenoic acid (DHA) is 500 mg EPA and DHA per day. This supplement meets the norm with its 600 mg DHA per day – with a single serving (2 caps)! Dr. Tobias omega 3 fish oil pills have an enteric coating to help increase absorption of the essential fatty acids in the guts. Thus, you will avoid fishy aftertaste. QUALITY: 2,000 mg Fish Oil with 1,400 mg Omega-3 Fatty Acids (600 mg DHA, 800 mg EPA) per serving. Enteric-coated. Purified from heavy metals by molecular distillation. The bottle contains 90-day supply. Contains gelatin (bovine), vegetable glycerin, natural vitamin E, and soy. CONSUMER REVIEWS: 1) Didn´t produce disgusting burps/diarrhea. 2) Helps with arthritis. 3) Helps to cure the condition of dry eyes. 4) Notably fewer joints pain. 5) Some reviewers mention that the size of the pill is quite big, but pill itself is easy to swallow. BioScience Nutrition is a health Supplements Company established in 2005. For more than 12 years, they have specialized in creating a wide array of nutritional supplements. Their Omega 3 Fish Oil is a pure, potent, and clinically validated fish oil supplement. Purified by molecular distillation at minimal temperatures to remove all heavy metals, mercury, PCB’s and other toxins. Provides high EPA and DHA levels with a total of 2,250mg Omega 3 Fatty Acid content. Fish oil from wild catch benefits the health of the heart, brain health, health of joints, mood, mental state, skin & hair. QUALITY: 2250mg Omega-3 Fatty Acids (900 mg DHA, 1200 mg EPA) per serving of 3 Softgels. Purified from heavy metals and other toxins to below detectable limits for human consumption. Has mild lemon flavor. The bottle contains 40 Day Supply. Contains gelatin, glycerin, natural vitamin E, and soy. CONSUMER REVIEWS: 1) Really Burp-less fish oil – no fish burps, no smell, has a citrus aftertaste. 2) Helps with pain in feet. 3) Helped to reach optimal blood levels. 4) Improved skin texture.5) Some reviewers mention that the size of the pill is quite big. The need to take 3 softgels per serving was disturbing some reviewers. This Norwegian-sourced fish oil is purified to remove lead, arsenic, mercury, cadmium, and microbials. Each serving contains 2000 mg of mg Omega-3 Fatty Acids with 600 mg of EPA and DHA. PuraVida Organique and its manufacturing facilities are GMP certified. GMP refers to the Good Manufacturing Practice Regulations promulgated by the US Food and Drug Administration. These regulations, which have the force of law, require that manufacturers ensure that their products are safe, pure, and effective. QUALITY: 2000mg Omega-3 Fatty Acids (240 mg DHA, 360 mg EPA) per serving of 2 Softgels. Purified from heavy metals. The bottle contains 90 Day Supply. Contains gelatin, glycerin, and soy. Enteric-coated. CONSUMER REVIEWS: 1) No fish burps, however, some reviewers had some fish aftertaste. 2) Helps to combat moodiness and stress. 3) Helped with arthritis. 4) Improved skin texture, has some impact on acne. 5) Price is affordable. 6) Milky color of capsules may seem suspicious. Cheapest bottle of fish oil capsules in our selection. Each bottle contains 60 pills, which is equivalent to 30 days’ supply. The concentration of Omega-3 is also not as high as in other reviewed brands. On the other hand, this product could be a good selection for people with an upset stomach, as they are recommended to start with little concentration of fish oil. Helps with improving immunity, cardiovascular health, circulation, and brain function and lowering bad cholesterol levels. QUALITY: 1500mg Omega-3 Fatty Acids with 600 Mg DHA and 800 Mg EPA Per serving of 2 Softgels. The bottle contains 30 Day Supply. Contains gelatin, glycerin, and soy. Enteric-coated. Lemon flavored. CONSUMER REVIEWS: 1) No fish burps, no fishy aftertaste. 2) Helps to cure the condition of dry eyes. 3) Helped with increasing good cholesterol level. 4) Improved energy level. 5) Price is affordable. 6) Some reviewers mention that the size of the pill is quite big. Barlean’s liquid fish oil meets the daily norm of EPA/DHA providing 720mg of EPA/DHA per serving. Barlean’s Omega Swirl is emulsified, so you absorb 3X more Omega-3s per spoonful than with standard fish oil or softgels. Superior absorption also means most people experience NO fish burps. It’s made with pharmaceutical grade ultra-purified natural triglyceride fish oil, so it’s free of mercury and other heavy metals. Has Piña Colada flavor. You can add it to yogurt, oatmeal, ice cream or smoothies. Kromhout D, Bosschieter EB, de Lezenne Coulander C. The inverse relation between fish consumption and 20-year mortality from coronary heart disease. N Engl J Med. 1985 May 9;312(19):1205–1209. F Gregor, Margaret & S Hotamisligil, Gökhan. (2010). Inflammatory Mechanisms in Obesity. Annual review of immunology. 29. 415-45. 10.1146/annurev-immunol-031210-101322. Investigating the inflammatory phenotype of major depression: focus on cytokines andpolyunsaturated fatty acids. J Psychiatr Res 2009;43(4):471–476. Polyunsaturated fatty acids and their relation with bone and muscle health in adults. ManganoKM(1), Sahni S, Kerstetter JE, Kenny AM, Hannan MT.